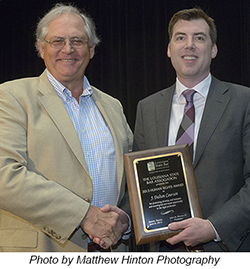 On June 6, 2013, the Louisiana State Bar Association awarded Dalton Courson with the Human Rights Award at its 72nd Annual Meeting in Destin, Florida. The Award recognizes outstanding efforts made by a bar association, law firm or department, individual judge or attorney, court, or a community organization or individual in promoting diversity in the legal profession. The Greater Baton Rouge Chapter of the Louis A. Martinet Legal Society also received the Award. Mr. Courson has an active litigation practice with an emphasis on insurance coverage, creditors' rights, and bankruptcy and business litigation. He is Co-Chair of the LGBT Litigator Committee of the American Bar Association Section of Litigation as well as an active volunteer for the New Orleans Pro Bono Project, which recognized him with the Pro Bono Century Award for providing over 100 hours of pro bono services in 2012. He was also named one of the best LGBT Lawyers Under 40 by the National LGBT Bar Association in 2012. He has recently published articles on combating implicit bias and bullying.